If you are looking to eliminate both frequent headaches and high blood pressure, here is what you need to do. A new study from Johns Hopkins Hospital in Baltimore, however, reveals another cause of frequent headaches. One that is also the cause of high blood pressure. What Can You Do to Eliminate Both Frequent Headaches and High Blood Pressure? So if you suffer frequent headaches and high blood pressure, you can kill two flies with one swat by cutting down on this one ingredient, which causes both. Salt in high doses makes high blood pressure worse. And high blood pressure is often blamed for frequent headaches. But the head researcher at Johns Hopkins, Dr. Lawrence Appel, wanted to know if they could cut out the middleman in the formula. Maybe it’s high consumption of salt that causes BOTH high blood pressure and frequent headaches. To test his theory, Dr. Appel controlled the diet of 390 study participants for 30 days. Half were kept on a traditional American diet, while half was put on DASH diet. The DASH diet is high in fruits and vegetables and low in fat. It’s the diet recommended by the FDA for people with high blood pressure. But, it didn’t end there. For both the traditional diet and DASH diet group, Dr. Appel broke the 30 days into three periods. Randomly, each person was directed to use a very high amount, medium amount or very low amount of salt during one period. Then they switched during the next period till they had tried all three versions of salt consumption (low, medium and high). After each period, the participants were asked how often they got headaches. There was no difference between the frequency of headaches in the traditional or DASH diet group. So general diet didn’t seem to have any impact on them. But, there was a huge difference with salt consumption. Using the highest amount of salt caused 1/3 more headaches than using the lowest amount. That’s significant. Salt is, of course, found in the highest amounts in highly processed food, which also includes other chemicals. So part of the results may be due to cutting out these foods to lower salt consumption. But since they used somewhat healthy DASH diet as comparison, it’s safe to assume that a high dose of salt does contribute to frequent headaches. The purpose for the revealing of this study is to prove that diet has a direct impact on normal headaches, as well as migraine. 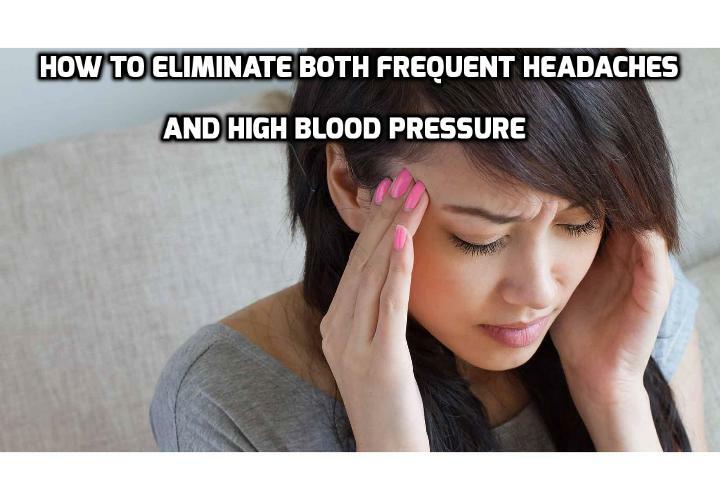 So by taking simple actions, you may avoid this horrible annoyance, by being able to eliminate both frequent headaches and high blood pressure. In my studies, I’ve found that most headaches and migraine attacks are caused by lacking one, single ingredient. By loading your body with this ingredient, you can eliminate almost all frequent headaches and migraine attacks. Next PostNext Which is Good for Your Heart – Moderate Exercise vs. Intense Exercise?